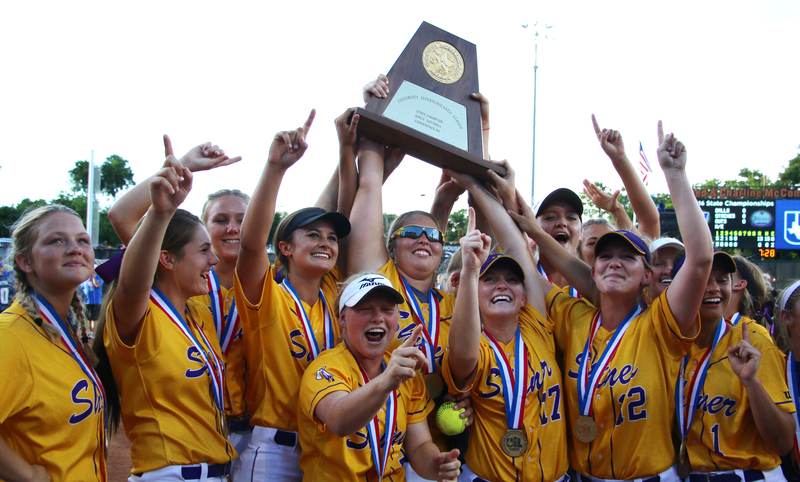 Shiner players raise the UIL Class 2A state championship trophy in celebration after defeating Harleton in the UIL Class 2A State Championship game. 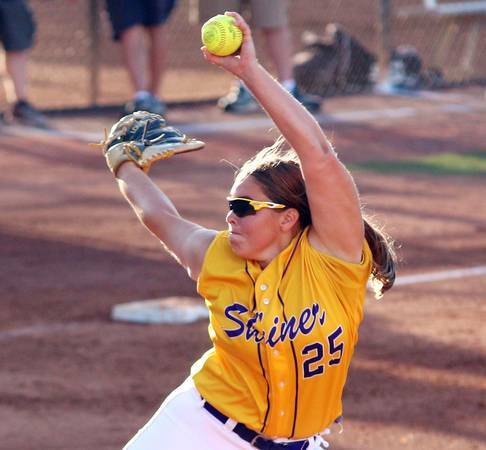 AUSTIN - The Shiner Lady Comanches spent last week hating a certain pitching machine but trusting it would pay off at the UIL Class 2A State Tournament. "It pitches all kinds of stupid stuff, and (coach Steven Cerny would) have us on it every day," said senior Hannah Nevlud. "It doesn't matter if we were hitting on the field with it, or we were bunting on the field with it during our athletic period. He always had us bunting on that machine." Shiner executed its early plan of attack, and five innings later, the Lady Comanches topped Windthorst 13-0 for their sixth state championship in program history at Red & Charline McCombs Field on Thursday. "One thing coach Cerny teaches you in life, failing to prepare is preparing to fail," Nevlud said. 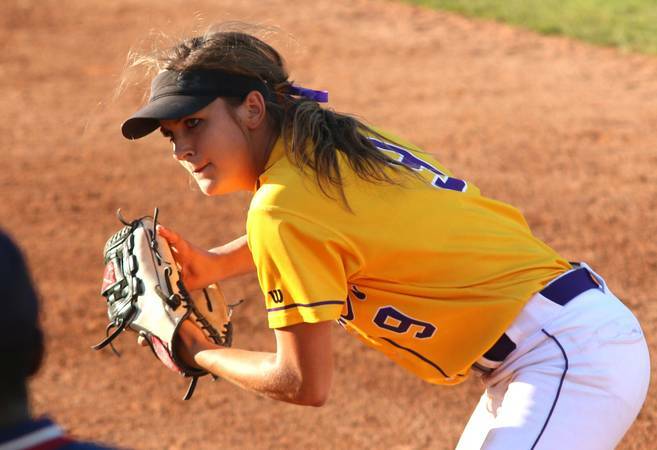 Cece Darilek pitched a perfect, 10-run-rule shortened game and was named state championship game MVP. Nevlud was 3-for-4 with a double and three RBIs, Mackinly Pilat was 3-for-4 and Taylor Wenske went 3-for-3. Shiner's big first inning began in a way the team least expected - bunts. Pilat and Hannah Nevlud each dropped one down for back-to-back singles to start the game, and Bethany Nevlud bunted into a fielder's choice that left everyone safe and the bases loaded. 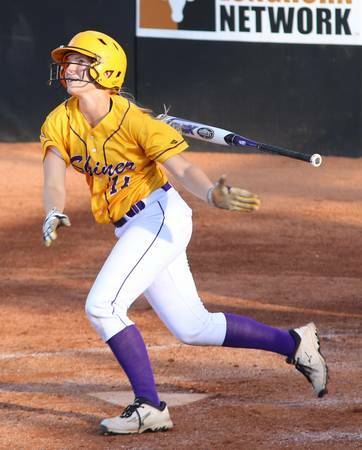 "Coach Cerny gave us the bunt sign - you're at a state game; you've got to put it down," Hannah Nevlud said. After Darilek drew a bases-loaded walk, Lauren Schuette added an RBI single and Kailey Williams followed with a sacrifice fly. Wenske later blooped a two-out, two-RBI single to right field for a 5-0 lead. The No. 9 hitter in the lineup, Wenske embodied Cerny's yearlong message - anybody can be called upon to do anything, at any time. 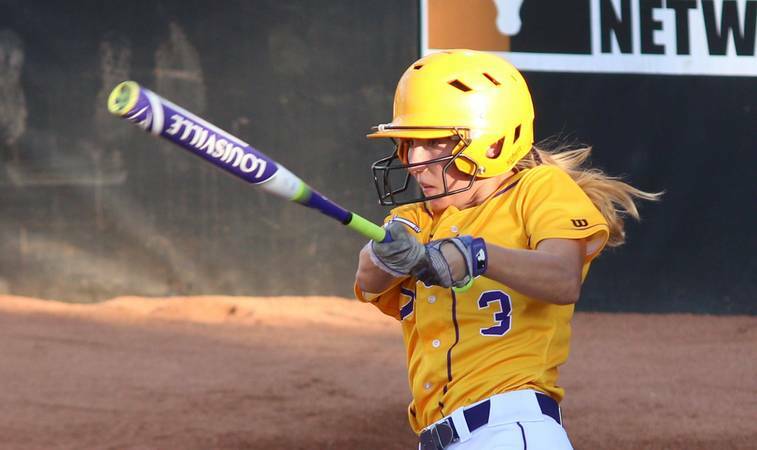 "Her first time playing was last week against Weimar (in the regional final); our starting right fielder got hurt," Cerny said. 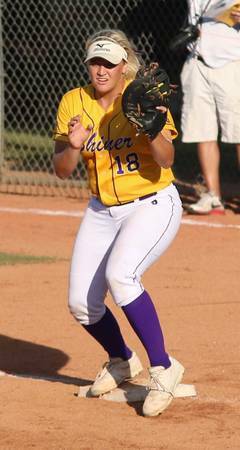 "She came in for maybe one or two innings, and then her first time to start - the state semifinals. What was it? 3-for-3? Awesome, unbelievable." Darilek's two-RBI single in the second made it 7-0 and drove in the Hannah and Bethany Nevlud, who hit a respective single and double to start the frame. The cousin Nevluds high-fived near home plate as Hannah scored the final run of her career. "We were playing Little League on the same team together. It's the best feeling in the world to be able to have her by my side through it all," Hannah said of Bethany. "She's literally my go-to girl. She's always there for me. She's my rock." Bethany Nevlud's RBI-single in the third pushed the lead to 8-0. 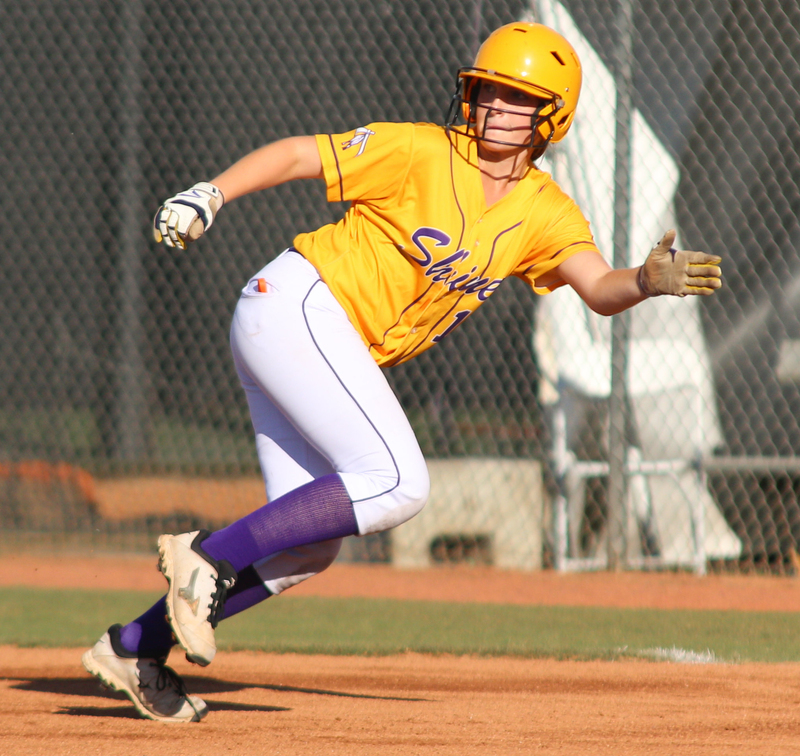 Shiner piled on five runs in the fourth inning behind an RBI groundout from Kailey Williams, Wenske's RBI single, and RBI single from Pilat and an RBI double Hannah Nevlud laced to left field. After the final out, the Lady Comanches rather calmly exchanged exultant hugs and lined up to shake hands. 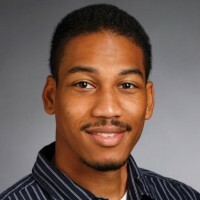 "Everyone was a lot more jittery and very excited (last year)," Darilek said. "Everyone was a lot more mellow and just focused (this year)." Part of its preparation Shiner ended up not needing - a five-run first inning and Darilek's perfection kept the Windthorst crowd quiet, unlike the Lady Comanches' practices last week. "We had music blaring, and we had managers with buckets and sticks, beating on them," said Kori Landman. But other parts of practice yielded gold medals for the second straight year. "The thing is, during the year, we never really bunted that much," Landman said. "But (last week) we would still bunt all the time, and we were like, why are we doing this? We never bunt. And then we come to the state game and bunt three times." S: CeCe Darilek and Madison Jalufka. W: Cy Schroeder and Emily Schroeder. Loss - Schroeder, C (24-2). Shiner's Taylor Wenske rounds second base against Windthorst. 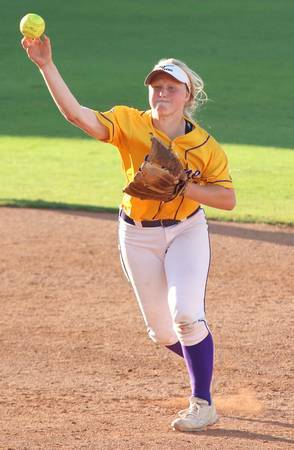 Shiner pitcher Cece Darilek delivers to the plate against Windthorst in the Class 2A State Championship game on June 2, 2016. Darilek pitched a five-inning perfect game in the Lady Comanches' 13-0 10-run-rule-shortened victory. 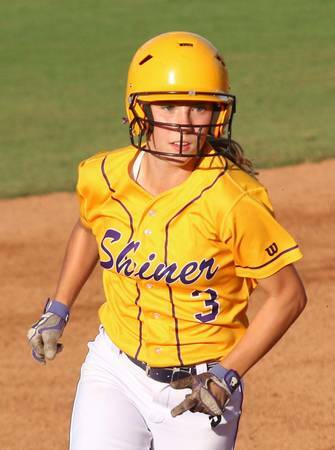 Shiner second baseman Lauren Schuette throws to first for an out against Windthorst. 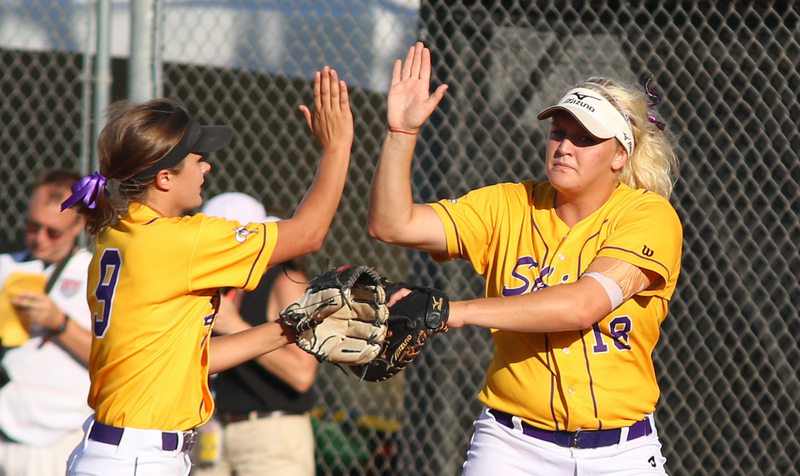 Shiner's Kori Landman, right, high-fives Lauren Schuette at the end of the third inning. Shiner shortstop Kailey Williams throws to first to retire a Windthorst runner. Shiner's Hannah Nevlud reacts to a Lady Comanche run during a five-run fourth inning against Windthorst. Shiner's Kori Landman rounds second against Windthorst in the UIL Class 2A State Championship Thursday. Shiner third baseman Bethany Nevlud throws to first after fielding a bunt against Windthorst. 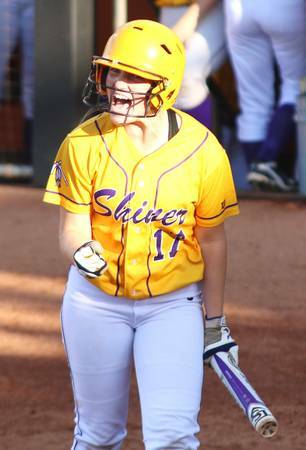 Shiner's Hannah Nevlud watches the ball after hitting a double. Shiner's Hannah Nevlud keeps an eye on the ball against Windthorst. 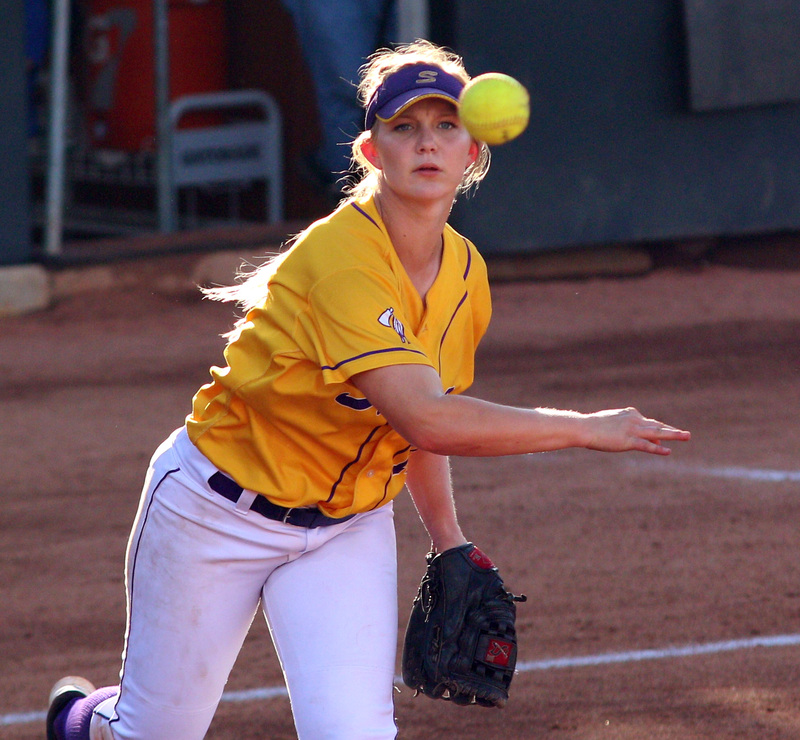 Shiner first baseman Kori Landman squeezes the ball for an out against Windthorst during the UIL Class 2A State Championship Thursday. 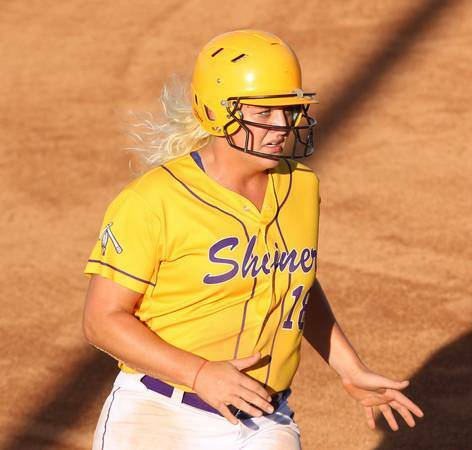 Shiner's Taylor Wenske singles to left against Windthorst in the UIL Class 2A State Championship at the Red & Charline McCombs Field on Thursday.